My explorations of the biology of Ulothrix zonata have taken me from Bollihope Burn in Weardale (see “Bollihope Burn in close-up”) to upper Teesdale (see “The intricate ecology of green slime”) and one of the outcomes is this representation based on the diatom-smothered filaments that I observed in Bollihope Burn, close to the sink hole. The picture illustrates the suggestion that I made in the post about Bollihope Burn – that the switch from “vegetative” to “reproductive” mode leads to less energy being available for the alga to manufacture the slime that it needs to stop epiphytes gaining a foothold. By intercepting the limited light that penetrates into the water, these algae can shade the host plant to such an extent that it cannot gain the energy it needs to grow. The mucilage is the equivalent of the “anti-fouling paint” that mariners use to stop barnacles encrusting their hulls. My image shows a single healthy filament of Ulothrix zonata at the bottom right of the image and, on the left, two filaments of cells that are producing flagellated gametes that will eventually be released. I write “gametes” with mild trepidation, as they may also be nascent zoospores associated with the asexual phase (see below). A third filament, in the background, is composed mostly of empty cells that have already released their gametes. There are no “male” or “female” gametes; any two can combine to form a zygote, so long as they come from different filaments. This zygote then attaches to the substratum and does little more over the summer. 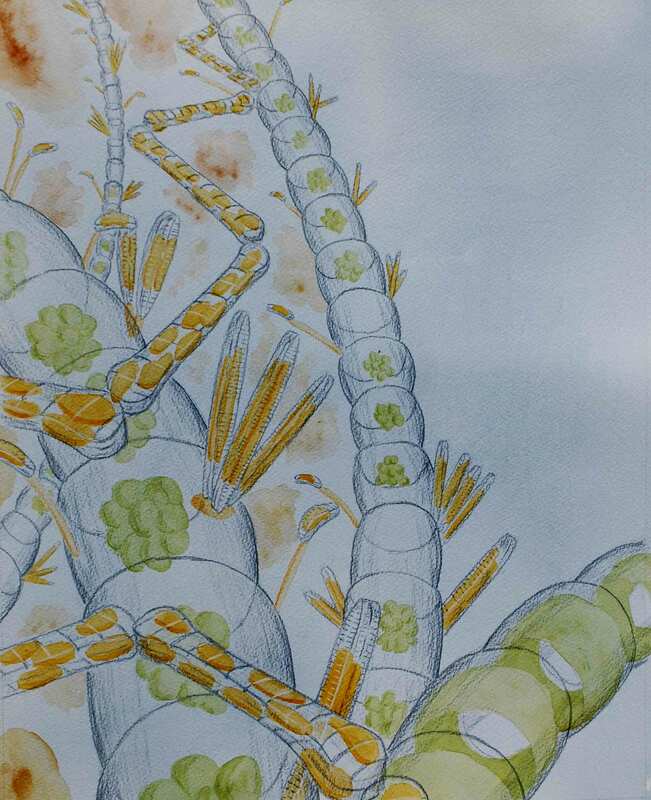 In my image, the Ulothrix filaments have been colonised by needle-like cells of Fragilaria gracilis, Achnanthidium minutissimum cells on short stalks, and a couple of cells of Gomphonema pumilum. There are also a couple of cells of Ulnaria ulna and some zig-zag colonies of Diatoma tenuis. The effect of these cells on the appearance of the Ulothrix zonata is marked, smothering the filaments entirely so that, with the naked eye, the assemblage appears brown rather than green. The diagram below summarises the life cycle of Ulothrix zonata and emphasises the point that the green filaments that most people associate with this alga are only a small part of the story. The cell contents divide in one of two ways. The first produces zoospores, each with four flagellae, which are released, settle and grow directly into a new vegetative filament. The second, however, produces a number of cells which are smaller but otherwise look similar to the zoospores except that each has two rather than four flagellae. These gametes then fuse with gametes produced by another filament to produce a “zygote” which, in turn, germinates to produce several (typically eight) zoospores, each with four flagellae, from which new vegetative filaments grow (see illustration of putative “germlings” in “The intricate ecology of green slime”). The life-cycle of Ulothrix zonata, following Lokhorst and Vroman (1974). “2n” refers to diploid stages; “n” refers to haploid phases (note that the vegetative filament is also haploid). The asexual phase can be produced at any time, but is stimulated by high temperatures; the sexual phase, however, is more strictly regulated. The formation of gametes only occurs under “long day” conditions, which means that it will happen as daylight hours extend in the spring. By contrast, the division of the zygote requires short day conditions and low temperature, meaning that the zygote is relatively inactive over the summer months, only dividing to produce zoospores, and ultimately, new filaments, in late autumn and winter. This creates a useful niche for the organism during a period of the year when nutrients are relatively plentiful in upland rivers (as they are washed off the land following rainfall) and grazers are relatively inactive. It also means that this apparently simple green filament actually has some sophisticated controls that regulates how and when it divides. I’ve talked about algal life cycles in the past, commenting that the concepts behind these are not always easy to grasp (see “Reflections from the trailing edge of science …”). The problem is that undergraduates of my generation were taught this as part of a broader overview of plant evolution and the variations between patterns in different groups tended to befuddle rather than enlighten students already struggling to grasp the big picture. The interesting twist to my explorations of Ulothrix zonata is that it has shown how the idiosyncrasies of an organism’s life-cycle can have a practical significance that helps the organism survive in a particular habitat. Knowing about the life cycle can, in turn, inform our understanding of processes occurring within a stream or river. The problem is that these topics have largely fallen off the agenda both for teaching and research, so we are generally limited to interpreting descriptions from old journals, and often forget completely the role that these factors may play in creating the mosaic of algae in a stream. Lokhorst, G.M. & Vroman, M. (1974). Taxonomic studies on the genus Ulothrix (Ulotrichales, Chlorophyceae) III. Acta Botanica Neerlandica 23: 561-602. * “Bhavacakra” is a symbolic representation of the cyclical nature of existence used in Tibetan Buddhism. The title of this post is also an affectionate tribute to Brian Moss, who died a few days ago. This entry was posted in Uncategorized and tagged algae, Bollihope Burn, life cycle, Ulothrix, Weardale. Bookmark the permalink. When I taught by Peter Dixon in the early 1960s at Liverpool, he disliked the term “life cycle” as this implied an obligate sequence of events, independent of the alga’s environment, rather “life history”. This indicates the varied response of an alga to its changing environment, as exemplified by Ulothrix. NB From my school Latin, flagellum/flagella. Bill, thanks – yes, “life-history” is probably a better term than life-cycle, particularly in the context of my piece which was very much about how environment and life cycle/history interact. I would, however, have had to find another title for my post!